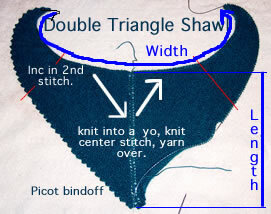 Easy construction: This is a modified double triangle shawl; the knitter starts by casting on 1 stitch. After that, she increases twice each row: once at the beginning and once near the center. After knitting “a while”, the knitter begins to increase 2 stitches at the beginning; this causes the shawl to have long “tails” which curl and appear to require sophisticated shaping.